LAHORE: The Persian festival of Nowruz can be celebrated in Lahore every day, thanks to Norouz Restaurant’s rich Persian flavours and an extended scrumptious menu. For starters, you need to know that Nowruz is being celebrated from the past 3,000 years. On this occasion, families get together for a luscious meal that starts with making prayers for the New Year. This was an important history lesson for me, courtesy restaurant manager Shakeel Abbasi. The idea behind the festival, he said, is the very idea behind the eatery. “At Norouz we serve authentic Persian food. The best quality of Iranian spices, herbs and the most hygienic meats are used in the food preparation process,” said head chef Tahir. Although he intimated that first-timers might feel the need to cultivate a liking for Persian cuisine, those familiar with it will “fall in love” with what’s on offer. Apart from Persian food, Chinese and Continental dishes are also on the menu which I felt is a good approach to attract all kinds of customers. Here’s what went about when I proceeded with ordering my meal. It was a scorching 46° summer day and I regretted my decision to even step out of the house till I was served with Dogh. The lightly-salted lassi prepared with a selection of Persian herbs calms you down right from the get-go; almost as if waves embrace sand on the sea shore after a long time. 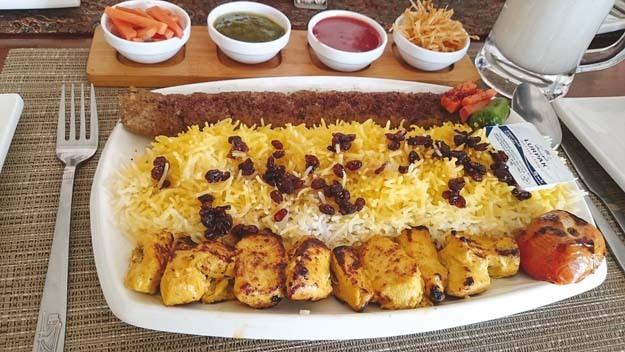 The main course, called Sultani, consisted of a skewer of Joojeh (grilled chunks of chicken marinated in onion and lemon juice), and a Koobedeh (Chullow Kebab) that is grilled Iranian kebab made of minced lamb, served with a bed of saffron rice, and topped with butter and zereshk berries. To make the Sultani more extravagant, pickled carrots, green chili sauce, red chili sauce and crisp fried onions were also served. As soon as I started with Joojeh, it made me smile and I was left in awe of its flavours. The Koobedeh was a bit dry but the perfect blend of mild spices made it a worthy experience. Saffron rice levelled up with butter and zereshk berries gave every bite a tangy hint of flavour. The Sultani really lived up to its name! 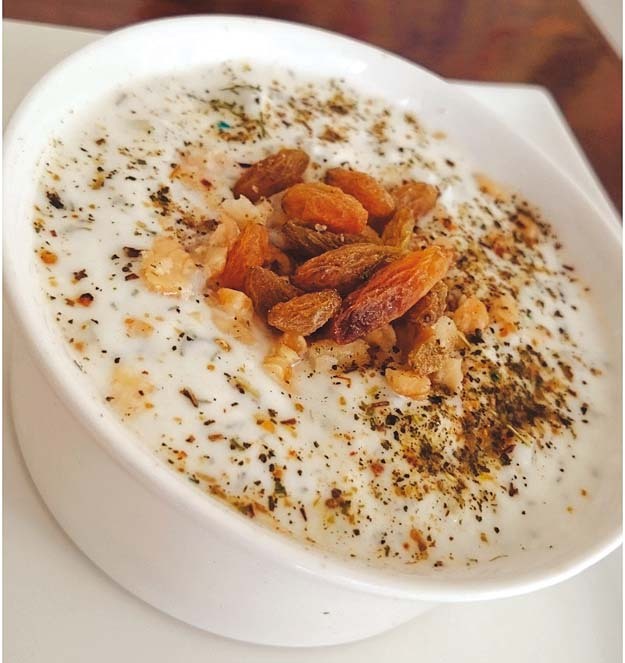 As a side to Sultani, I tried a Persian raita called Masto Khyar which was a blend of yogurt mixed with different green herbs, chopped walnuts and sliced cucumber. Masto Khyar’s contents gave it a very unique blend of flavours and this covered up for the absence of Persian desserts on the menu. Lastly, I was treated with complementary Iranian Kehwa which was served in a beautiful kehwa glass with sugar cubes. Helping with digestion, it was the perfect ending note to the meal. One has to appreciate Norouz for presenting the perfect Persian image as the restaurant is full of paintings, decorations and antiques that make for a pleasant sight. The restaurant has the best and the most soothing collection of Persian music that remains easy on the ears. I have never seen better presented Persian food anywhere else. The Sultani looked so good that for a moment I thought just looking at the dish would be more fulfilling than actually digging in. The service was great and the staff was very pleasant. Abbasi had good knowledge about Persian heritage and all the paintings that they have on the walls. Serving time hovers around 35 minutes. Verdict: I’ve been fortunate enough to have Persian food in three different countries but Norouz was by far the best experience.